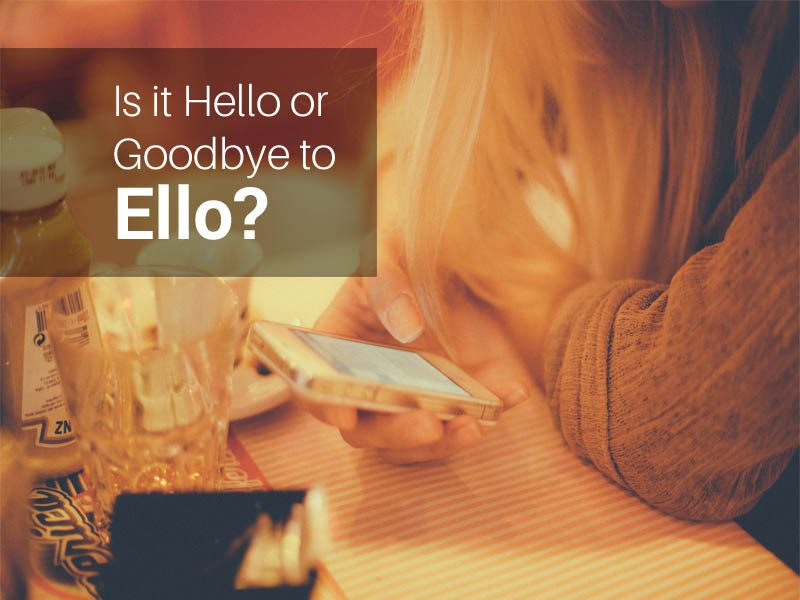 Is it Hello or Goodbye to Ello? Advertising on free social networks has been a necessary evil because someone needs to pay to keep the servers running. And, let’s face it, we’ve become so used to loading our computers and smart phones with free apps that paying for online access to almost anything seems anathema. Audiences are becoming more sophisticated and questioning exactly what happens to their personal data in exchange for free social media access. Ello is disrupting the access-for-information model though and has launched an ad-free, tracking-free social media network. So, what’s it about and do you need it? The unique selling proposition of this new social network is its lack of ads. Ello condemns mainstream social media for being deceitful, manipulative and coercive and, in its manifesto, Ello’s founders promise not to track subscribers and not to record their activity. They also commit to not enforcing a real-name policy and do not tolerate abusive behaviour. Judging by its manifesto, it might seem like Ello is not the friendliest place for businesses. Why would a business be interested in joining a social network that does not allow advertising? If we look at this question from the traditional point of view, a business would have no reason to include Ello in its marketing strategy. But marketing has changed a lot with social media in the past few years, too. Today’s content-driven marketing model includes engaging with potential customers by sharing interesting and relevant content. Audiences do not receive messages they are not interested in; instead, people have the freedom to choose the brands they want to engage with. Ello could succeed with a purist marketing approach for businesses where click-through rates and tailored advertising return-on-investment is left behind for quality engagement. What Kinds of Businesses could Benefit from Ello? As long as Ello’s subscribers play by the rules, this new social network could be used as an efficient marketing and communication tool. It depends on each business’s needs and objectives if Ello is a good choice for them or not but the sparse, quiet feel of the site appears to resonate well with creative industries and individuals. The founder of Threadless is there and artist Heather Watts has an engaging page with her words and fine art pieces. There may be some merit in businesses in more traditional sectors showing leadership and trying Ello if resources are available to manage yet another social media channel. What businesses also need to think about is whether their potential customers are on Ello and are planning to stick with the network. And, of course, businesses need to consider the potential longevity of Ello in relation to who is paying to keep the servers running. So, Do We Like Ello? We requested an invitation three weeks ago and are waiting patiently for the golden ticket to arrive in our e-mail inbox. Going to the home page and clicking on the circles to uncover profiles is a fine way to pass time but we’re not yet convinced it’s for us. The site feels like a cross between tumblr and Instagram, which isn’t a bad thing in itself, but for a small business with dozens of priorities at any time, Ello may not be commercially viable. We’ll post a follow-up article on our Ello experience once we are up and running.